How Safe are Your Supervisors at Your Construction Sites? Your supervisors ensure that the construction work at the site goes as planned and any discrepancies are reported to the higher authorities at the earliest. They are so very important for the success of your construction projects, aren’t they? The safety of your supervisors is, therefore, important. Right from the trainings they get to learn to work around construction sites, to the clothes, helmets, and shoes that they are provided with, everything should be attuned to provide the best possible safety to the supervisors against any danger that they may across. 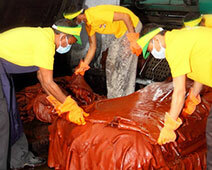 Supervisors tend to walk around the site a lot; therefore, their shoes have to be lightweight; they have to be have ample space for the toes; at its most basic, the shoes have to be so comfortable that the wearers can walk around for long, without getting painful / tired feet at the end of the day. They are not the right fit if they are not Robust enough! The shoes have to be strong enough to protect the feet of the wearer against bricks that may fall on his feet, the small and large equipment that may accidently run over his feet, and hundreds of other settings in which the supervisors may end up with injured feet. The primary job of a pair of protective footwear is to protect the feet of the wearer against shocks, slippery surfaces, and injuries caused by fall of heavy objects; however, this does not mean that the shoes have to look ugly. Your supervisors and other professionals are going to wear these shoes the entire day when they would have to be on the construction sites; and therefore, it is important that they like the shoes. Now that you have come to understand the kind of shoes that you should get for your supervisors and other executives who frequent the construction sites, make sure you go through all the choices that you have at your disposal and give your team the best safety shoes and work boots. 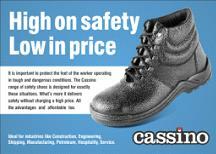 Here you can see our latest additions to our line of construction safety shoes and work boots. 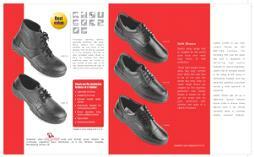 We are one of the most respected safety shoes manufacturers in India. Besides meeting the domestic demand for the best quality safety shoes and work boots, we export our shoes to many countries. 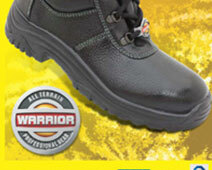 We have been a trusted manufacturer and supplier / exporter of safety shoes and work boots for over 13 years. And during all these years, we have ensured that we keep on adding more features to our shoe collections that can help the global workforce go about their work with confidence about their safety. Fighter & Cassino Industrial Shoe brands from Liberty Shoes are ideal for Construction, Infrastructure & manufacturing industry.